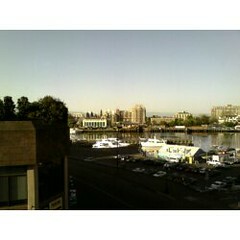 I was sitting in my office this Monday morning at 7am, enjoying the view. It was so perfect, I just had to share it. Why was I in my office so early? I was participating, via telephone conference, in a CIRA Nomination Committee meeting. I was recently selected by the existing CIRA board to participate in the Nomination Committee responsible for selecting a subset of candidates who will stand for election for CIRA's board over the next three years. Who is CIRA? They are the not-for-profit organization responsible for selecting the policies and direction to guide the allocation of Internet domain names in Canada. If you have, or visit, an Internet site that ends with ".ca" you have seen a domain name managed (usually indirectly) by CIRA. I had almost forgot, but a few months ago I submitted my name indicating interest in participating in the CIRA nomination committee. Turns out there were over 400 people who expressed similar interest. The existing CIRA board ranked each of these candidates based on experience, diversity, etc, and whittled the list down to 25 individiduals. From that list of 25, the board selected 15 individuals. I was chosen as one of them. This should be an interesting experience. Our role is to review the list of all BoD candidates who are nominated, and to select from that list a smaller set of candidates who will run for election. I look forward to the policies and priorities we'll be discussing as a group.